The strike of a hand. A fist to the face. The spewing of hatred and vile words. The fear of a monster. The torment. The abuse. Broken bones. A fractured rib. A slap to the face. A belt whipping across your back. Endless amount of bruises and sexually abuse. For seven years, Evelyn Beaumont lived in her own personal hell. She was trapped and living in fear by a man she once trusted who violated and destroyed her leaving her broken and shattered. Can a woman who has been badly damaged and destroyed find it in herself to escape and face her fears? Will she find the strength to ask for help? Elemental fear is not a story that is light hearted. This book is raw, intense, dark and raises an awareness on domestic abuse. From an outsider, we can easily say what a person should of done the first time a hand is raised. It is easy to say but sometimes taking that first step is the hardest thing to do. Admitting and screaming to the world that abuse is happening sometimes is hard to do when fear has been implemented. And that's what happened in this book. It is a story of a young woman who wanted to protect her sisters from her boyfriend because she was fearful of what he was capable of doing. She was afraid that he would hurt them so she had to endure the abuse to protect them. While I may not agree with Evelyn's logic, I applaud the author for taking a chance and raising awareness that there are some people who are debilitated by fear. Fear can definitely hold a person back but for Evelyn it took her years to find he strength and courage to fight back. This book is so graphic and paints a raw portrayal of domestic abuse. While the story is heavily centered on abuse, Ms. Frost was still able to incorporate a love story of a broken woman finding salvation, strength and courage to live through the help of one man's undying love. And this worthy man didn't see a broken, fragile woman but a beautiful woman who is a survivor and fighter. 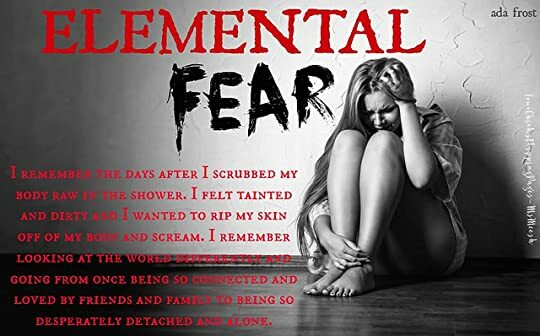 So if you are looking for a book that needs to be heard of a woman's struggle to reclaim her life back, then I would give Elemental Fear a try.